4. Gurgaon customers will get Chocolate Brownie instead of Choco Lava Cake due to inventory constraints. 6. LazyPay has the right to amend the terms & conditions, end the offer, or call back any or all its offers without prior notice. 7. In case of dispute, LazyPay reserves the right of final decision on the interpretation of these Terms & Conditions. 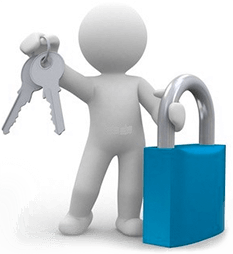 - Any user who is eligible for more than one offer will receive cashback of the higher amount only. - All cashback received will be adjusted to the outstanding amount at the time of bill payment. - You can pay us back on 3rd and 18th of every month. - To check your transaction history and cashback amount download Citrus app available on Google Play Store. - Cashbacks would not be applicable for cancelled/refunded transactions. 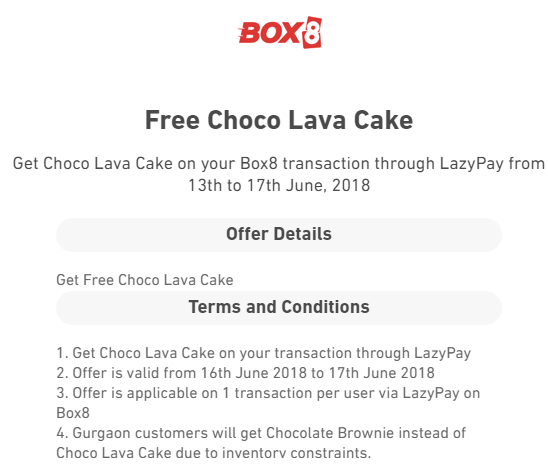 I don’t have box8 account to verify this..
Offer valid from 13 – 17 June.. i could see offer on box8 home page..